The current move of God, sometimes called revival, is often compared to a river. The illustration is that the “River of God” is this current revival, and we can get in the river, or we can stay on the dry land. I think it’s time that we expand that metaphor. For those who have been in the river, it’s been good to be in the move of what God is doing. It’s certainly been exciting, fairly often, it’s been confusing, and it has not been bo ring. One of the basic truths about a river is that a river never holds still. A river is always moving from its source to its destination. Sometimes, I fear that we’ve missed this truth about the River of God: it’s going somewhere. For this article, I will leave aside the very appropriate questions of whether we approve of where the river is going; I’m going to assume that if you’re in this river, you want to be in this river, and you want to go where it is going. When I was a kid, my friends and I got some inner tubes, drove upstream, jumped into the local river, and floated down the river. We ended up terribly sunburned, bruised from bouncing off of things, very late to work (the river was slow that day) and altogether, kind of disappointed. I decided that day that floating out of control was not my favorite way to enjoy a river: the reality is that when you’re drifting in a river, like a piece of driftwood, you’re at the mercy of the river’s currents: wherever it goes, you must go. We ended up stock on sandbars more times than I could count. 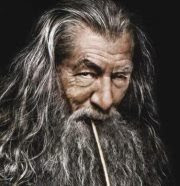 If you want to be able to choose your position in the river, you must be paddling: forward or back, it doesn’t matter for the purpose of control (though it matters greatly for the purpose of progress). Being intentional give us freedom to choose; if we just float along with the crowds, we’ll always go where the crowds go, and that is certainly not always a good choice. Remember the lemmings. I have decided that, in this adventure in the river, I want to make progress: I want to choose my path in the river, rather than drift lazily from place to place, I want to avoid the (many) obstacles, and while I am thoroughly enjoying the trip, I really am eager to reach the destination: I want to make choices that take me there quickly. This isn’t about control (though some make it that); this is about choosing responsibility over leisure or slothfulness. Years ago, when I was a young buck, I went on a very real river adventure. A group of us from my college, with a professional adventurer as a guide, went on an expedition in the far north reaches of Canada. 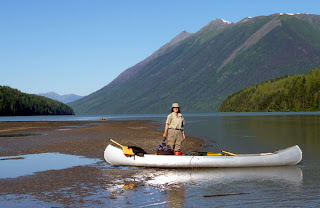 Over the course of seven weeks, we canoed 1400 miles (and carried the canoes overland on 40 portages!) over five river systems up near the arctic circle in the territory now known as Nunavut, Canada. This was back in the day before cell phones: we were pretty well stuck in the arctic north until we made it to Hudson’s Bay, and the little village (eponymously called Eskimo Point) there. There were several dangers from living in the arctic, but the greatest dangers may have been from the rivers themselves. Powerful things, rivers are; they can wrap an 18’ Grumman aluminum canoe around a rock in a river in about half a second. Knowing that danger, we all studied the river very carefully, and we chose our course down the river very carefully. In reality, there were several dangers that could cause us real troubles in the rivers. All of them came from choosing our course poorly. There were some basic principles we used for choosing our route down the river. When you’re coming up on obstacles in the river, steer clear. The spiritual principle is straitforward: as we travel through this revival with Jesus, there will be obstacles: there will be things that can offend us, thing that are done wrong, mistakes that are made. We have a choice: get out of the river or steer clear of the mistakes, and instead focus on the good things that God is doing in you here. If you want to find problems (and some people do), then you’ll pay a serious price for your labors. 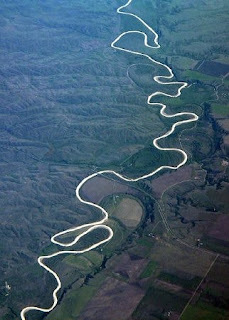 There are two places in the natural course of a river, where the river actually flows backwards. Both are dangerous. The first is behind rocks in the middle of river, where the current can draw you in, under the water pouring around the rock and sink you quickly. (It's curious that the place of “moving backwards” is connected with the obstacles, isn’t it?) The other is along the edge: there are very strong eddies where the water swirls backwards. If you’re not careful, they can flip your canoe in an instant. I know: I’ve done it. Principle: There are some people in the river that are not moving forward in God. There are some folks that have “tasted the heavenly gift, and have become partakers of the Holy Spirit, and have tasted the good word of God and the powers of the age to come,” but have not moved forward in God. These are also to be avoided. Wherever God is moving, there will be people resisting his move. That does not need to be us. 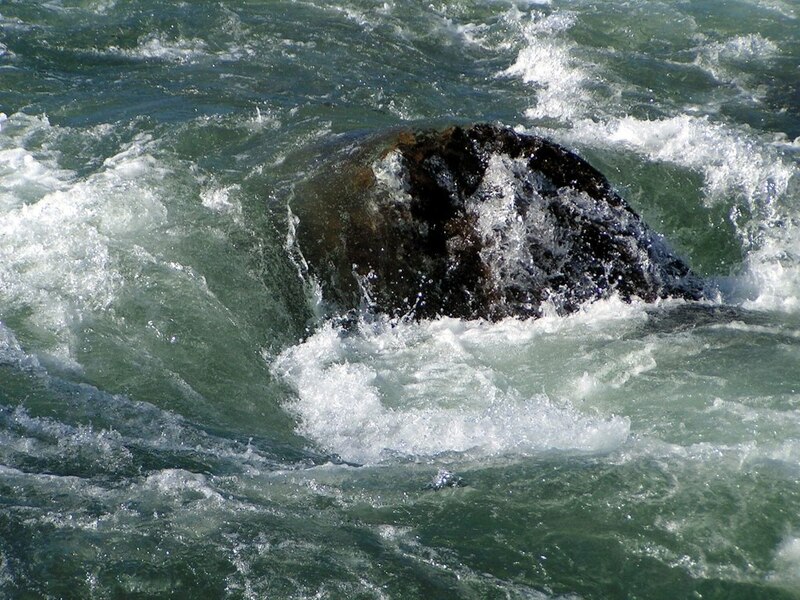 When you’re coming up on multiple rocks in the river, the water forms a “V” between them. Keep to the deep water in the center of that “V”. Even a tiny rapids, if handled poorly, can sink a canoe in seconds. I did experience this one first hand. It was … uncomfortable. Principle: stay in the deep places in God. Don’t snuggle up close to obstacles or offenses: stay as deep as you can in what God is doing. I’ve already mentioned the danger of the current wrapping a canoe around a rock. I’ve seen that done (it didn’t happen on this trip! ), and it is very much NOT pretty! 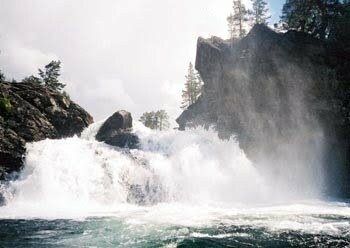 Principle: When we are in the River of God, there is real danger from the obstacles. Our ability to participate in the river may be destroyed if we get hung up on the naysayers, on the problems, on the religious spirit that loves to destroy what God is doing. Some rocks never cleared the surface of the water. Just below the surface, they lurked, ready to tear the bottom out of our aluminum canoe. Principle: There are dangers you don’t see. Use your gift of discernment to avoid things that ‘seem’ OK but really aren’t. Failure to discern may hurt you badly. We could get hung up on a gravel bar, or a sandbar. If you don’t watch where you’re going, you may end up watching the rest of your party disappear around the bend while you and your mates jump overboard and get completely cold and wet, as you wrestle your boat off the sandbar and back into the real current. Principle: A wise man once said, “Major on the majors and minor on the minors.” The trick to avoiding the sandbars is to stay where the river is deepest: to train yourself to watch ahead where the deep places are and stay in the deep waters. Those who don’t watch carefully will be the ones stuck on the sandbar. When the river turns, the inside of the turn is shallow, often filled with sandbars or gravel bars. The deep water is toward the outside of the turn, but not the very outside of that turn. The inside of the curve is the sandbar: a wonderful place for a picnic, watching others make progress while you are not. The outer fringes are dangerous: rocks, trees, roots and other freshly exposed obstacles are in the way of your progress. The deepest place is just inside the curve from those obstacles: stay there. Principle: Haven’t we heard this before: Stay in the depths. Stay in the heart of what God is doing and saying. Avoid the fringes. Avoid the shallows. Don’t go there: focus on staying in the depths. There are times when the rapids get too strong, too tumultuous. In times like that, staying to the shallows is a fine way to travel. Principle: there are times when revival is overwhelming. I know a number of people who have gotten burned out on 7-day-a-week meetings, or who have lost their families because they were always following every little thing that God might have been doing. Principle: When things get intense, relax. Don’t feel like you need to be in the middle of everything. Sometimes, being in the middle of everything will kill you. Some places are so dangerous, or are so shallow, that the only thing you can do is get out of the river and carry your boat and all its contents to another place in the river, or to another river. Principle: A revival is the move of God among human beings. It is entirely possible that the humans involved can go completely “off the deep end,” or they can steward the revival so carefully that the whole thing peters out. When it stops bringing life, stop giving your life to it. It’s completely OK to quit participating in something that has been taken over by religion, or that has had all the life choked out of it. There’s the secret about river travel: if you want to make progress fast, stay in the depths. The riverbed has a profile: there are deep places and shallow places along the entire length of the river. In a relatively young river, or near its source, the river is likely to have more obstacles, more dangerous rocks and snags. As the river ages, or as you move out of the mountains into the flatlands, the river is less dangerous, but you have far more curves to deal with, along with the erosion that comes with them. If we commit ourselves to the depths of what God is doing, then we’ll make the best progress, we’ll grow up the fastest, we’ll reach maturity as quickly as possible. It’s true: we’ll miss out on the sandbars, on getting hung up on obstacles, on being destroyed. Won’t that be a shame? This was so well thought out and written it kept me thinking and writing all day! Thanks so much! It also got me to thinking about those with us on the trip. Sometimes it's unavoidable that we have to wait for those we're traveling with, or get in the water to help them out. I'm amazed by the patience God has with us. A revival is a move of God among human beings (with all our flaws and faults). Yet God eagerly takes our mistakes, wades into the cold water with us, and somehow turns the whole event into something worthwhile. Like pieces of broken glass that He rearranges into a beautiful new pattern, a mosaic. It's like He has fun in the waterfalls! He even has fun picnicking on the sandbars waiting for us! And then I realized that His destination of maturity is so far higher than ours, and our levels of maturity are different from each other's, and I wondered why I'm in such a hurry to learn my lessons and 'get on with it' when right now Daddy God is wanting to play with me along the way! I never heard of Daddy God wanting to play with us until He laughed in His 'encounter' with me the other day. I had to look up some words like joy, sing, dance (twirl) again and realized He really does have more of a sense of humor than I thought. It's especially comforting to realize that when I'm trapped under my canoe, He's going to get me out, and then laugh with me for awhile about the irony of thinking I'm out there to help everyone else, when all the while I'm so easily turned upside down!! It's a good thing I've got friends like you coming down stream (even though you've already been down it before me)to help me along the way! Nice post and really good to read this post. It's always pleasure to read this kind of blogs. thanks for sharing this valuable post.